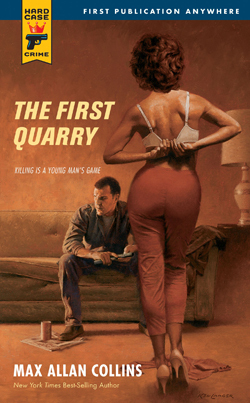 The First Quarry by Max Allan Collins is not the first Quarry book in the series, I know, that don’t make any sense. This book was published in 2008, the first book, simply titled Quarry was published in 1976. This book is actually the 8th book in the series, but is a throwback in time to Quarry’s first assignment. It is a kind of origin story if you will. This was published by Hard Case Crime, a publishing house which has brought back forgotten classics as well as new books from some of the best authors in the noir and crime fiction genres. Even though this is not the first Quarry book, it is the first one I have read. I usually don’t like to read books out-of-order, but this was on sale and I could not pass it up. I figured since it is Quarry’s first case, it would be all new to me anyway and wouldn’t hurt the enjoyment of the book. Boy was I right! This book is pure pulp noir goodness! This story starts with a young man coming back from ‘Nam and finding his wife in bed with another man. This man goes to visit his wife’s lover and finds him working under his car. The car falls on the man killing him. Soon this young man is contacted by The Broker who gives this young man the name Quarry. The Broker sets Quarry up as a paid assassin and assigns Quarry his first job. He must kill a fairly famous author who is also a professor at a Mid-West college. This is not a simple hit, he must also destroy all copies of the book the professor is currently working on after killing him. It gets even more complicated as Quarry runs into a number of people who get in the way of his job. This book was a fun read with some great humor and an amazing story with a character I cannot get enough of. I cannot wait to start reading this series from the beginning. I think if Raymond Chandler was writing today, it would read a lot like Collins. I highly recommend this book for people looking for some fun modern pulp and you will soon be seeing my review of the first book in the series, Quarry. I hope to get as many of these Quarry books read before the new television series starts on Cinemax next year and look forward to watching the 8 episode first season.